We’ve had plenty of big stories here at Retraction Watch this week, but even we must admit that the world’s biggest retractions — by press attention, anyway — have been in sports: Lance Armstrong (thanks, Oprah!) and Manti Te’o (thanks, Deadspin!). This case describes the physiological maturation from ages 21 to 28 yr of the bicyclist who has now become the six-time consecutive Grand Champion of the Tour de France, at ages 27–32 yr. Maximal oxygen uptake (V̇o2 max) in the trained state remained at ∼6 l/min, lean body weight remained at ∼70 kg, and maximal heart rate declined from 207 to 200 beats/min. Blood lactate threshold was typical of competitive cyclists in that it occurred at 76–85% V̇o2 max, yet maximal blood lactate concentration was remarkably low in the trained state. It appears that an 8% improvement in muscular efficiency and thus power production when cycling at a given oxygen uptake (V̇o2) is the characteristic that improved most as this athlete matured from ages 21 to 28 yr. It is noteworthy that at age 25 yr, this champion developed advanced cancer, requiring surgeries and chemotherapy. During the months leading up to each of his Tour de France victories, he reduced body weight and body fat by 4–7 kg (i.e., ∼7%). Therefore, over the 7-yr period, an improvement in muscular efficiency and reduced body fat contributed equally to a remarkable 18% improvement in his steady-state power per kilogram body weight when cycling at a given V̇o2 (e.g., 5 l/min). It is hypothesized that the improved muscular efficiency probably reflects changes in muscle myosin type stimulated from years of training intensely for 3–6 h on most days. has been repeatedly used by Armstrong and his lawyers to fend off allegations that his cycling success came in part through doping. Oops. Scientists have paid attention, too: The paper has been cited 62 times, according to Thomson Scientific’s Web of Knowledge. In summary, although great insight into human physiology can be gained from carefully controlled examinations of elite athletes, poor experimental design and methodology can lead to inappropriate conclusions, which in the case of a sporting hero can quickly become more hype than fact. Coyle’s data supporting the assumption that training can improve cycling efficiency in an elite cyclist are not compelling. It appears that other more conventional explanations describing why Armstrong is such a successful cyclist may be equally tenable. Coyle responded, and also later provided original data on which his conclusions were based. In a new letter, the same authors — plus one member of the Science and Industry Against Blood-Doping (SIAB) Research Consortium, Michael Ashenden — reiterated that their new analysis of Coyle’s data demonstrated significant flaws. You can read more about the errors at The Science of Sport. company that had insured Armstrong’s team against paying a $5 million bonus if he won the 2004 Tour. After Armstrong’s victory, SCA refused to honor the team’s claim, arguing that it suspected drug use by Armstrong. Ashenden was a consultant for SCA. The author very much appreciates the respectful cooperation and positive attitude of Lance Armstrong over the years and through it all. In fact the gist of the Australians’ critique was that the data used to determine that there was increasing muscular efficiency was flawed – ie that there was no reason to believe that there was such an increase – rather than such an increase could only result from illicit means. 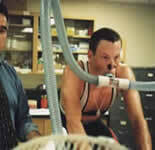 I am assuming that blood transfusions and EPO shouldn’t look any different than altitude training in output – assuming they are measuring their oxygen consumption correctly this should not cause an increase in muscle efficiency – unless at higher concentrations of oxygen muscle efficiency increases in a greater than linear fashion? And he probably wouldn’t have had a blood transfusion before sessions with Coyle and maybe not EPO either. Testosterone and human growth hormone might increase muscle quantity but muscle efficiency? I agree. The Australians weren’t saying that the only explanation was doping… They were saying that “the data used to”…show…”increased muscle efficiency was flawed.” Now, he got that boost from real training, but unlike others who weren’t using outside aids, he was able to train more and harder because of the supports he used. Coyle’s article is probably just an advertising gimmick for Lance and should be retracted. This is consistent with anecdotal evidence that testosterone supplements, for example, help an athlete recover from injuries faster and respond to training better. Without the supplements, intensive training results in exhaustion and injury sooner. Whatever Lance used, it didn’t act like a magic potion that allowed him to get stronger just sitting on his couch. He still had to work out harder and longer than anyone else. Lance’s real edge was not so much his doping, but his obsession with winning at any cost. Those who tried to match him in training intensity were soon injured and dropped out. With his single-minded concentration, he was able to ignore pain and exhaustion and just keep on training. The “dope” just supported his obsession. If cyclists were allowed to use anything they wanted to build themselves up, it is likely that many of them would suffer and die from the side effects of their chosen drugs. The anti-doping regulations really save them from themselves, because otherwise they would sacrifice their health and even their lives to win. Perhaps one day there will be the Superlympics, just like now we have the Paralympics, for athletes of this type who are so driven to win that they are willing to use certain classes of enhancers. I feel sorry for the poor guy. He cheated, he has admitted it, now let him have a bit of peace. He went through hell with cancer, survived and won races, the other athletes are probably just jealous of his success, despite using similar enhancers. He mislead people, but didnt harm anyone per se, and has done alot of amazing charity work. We can forgive this one, surely? He is a cancer survivor, thats how i will remember him, not as a cyclist, but as a survivor. If he wishes to cycle again, let him, he wont cheat again, and let him have a bit of life back – if anyone will be great at catching future cheats, and rehabilitating them, he is the man to do it. I don’t see how this is different from the guy who cheats on a grant and gets it because of that. Of course there is harm to others: to those who could have won honestly, instead. Plus there is the harm caused to the entire sport/discipline. It would be worth looking at what he did to anyone who suggested he doped before stating he “didnt harm anyone per se.” He was brutal to former teammates, and filed and won lawsuits worth millions. It’s not the doping, it’s not the lying, it is the utter disregard for his fellow humans in pursuit of his goals that should prevent him from ever competing again. That’s a strange ethical double standard, Stewart. The Tour de France victories Armstrong won as a drug cheat took 7 victories away from riders who rightfully should have won. So in reality he did “harm” a number of people “per se” (not to mention his family, colleagues etc.). On a recent thread concering a scientist found to have included fabricated data in a grant application you wondered: “How do those who put in for grants feel about others winning the award using data they shouldn’t have?”. Well perhaps in the same way that you suggest “the other athletes are probably just jealous of his success”, maybe those other scientists are “just jealous” of the grant cheats “success”. On the “Can-we-or-should-we-rehabilitate-scientists-who-commit-misconduct” thread you advocated a rather brutal zero tolerance vengeance ” If a science-fraud person makes up a blot, the he should be gone. And good riddance!”. And yet in the case of an individual who has cheated himself to success and sporting glory over an entire career you suggest “We can forgive this one, surely?”. Personally I consider that those that cheat in science should be punished in the sorts of ways that they are punished, commensurate with the nature of their misdemeanour (i.e. involving retractions, publishing bans, grant application bans, supervised research for a period, sackings and so on, not to mention effective career death for serious miscreants through “self-shredding” of one’s reputation). Likewise someone who cheats at the extraordinarily systematic level that Armstrong has done over his career should receive the same lifetime sporting ban that others caught using drugs receive. It’s an astonishing point of view that because Armstrong was effectively forced to admit his guilt and had cancer that makes everything alright! Armstrong was a sportsman in a physically-demanding sport and so had a necessarily limited career which he effectively completed. It was a career in which he milked everything he possibly could in a single-minded ruthlessness to the detriment of others (and ultimately to himself). He can get on with the rest of his lfe now. A scientist found guilty of serious fraud likely loses his career for ever. Unless you count the people and companies he falsely sued for liable or the former friends whose reputation he destroyed by his lies. He hurt lots and lots of people. He should get zero sympathy from anyone. Lots of people survive cancer and don’t become mega-bully jerks. He most certainly did harm people: The team mates who felt compelled to use the same doping regime (hey, has anyone done any studies on long-term effects of blood/EPO doping? ), the sponsors, the donors, and most importantly the previous accusers who were – figuratively speaking – beaten to pulp by his lawyers for making these true(!) accusations all the while LA kept up his lies. I’d say that you’ve pretty much nailed it, except for one thing: I don’t believe that Coyle’s motivation for publishing the paper was to advance Armstrong’s legend. Well, I think a little forgiveness now and then doesnt do any harm, it’s not like he is writhing away in the dark, making excuses and excuses. He is out in the open for all to see. This is very different from fraudulent grant winners who then still don’t admit anything or try to blame others. Why aren’t you forgiving Stapel? He even wrote a book about it, admitting all. His case is similar to this one. He cheated for many years, was a star and an icon for many people. The fraudulent scientists you mention – how many of them appeared on Oprah, broadcast around the world and admitted their acts in full face of the media? I am not defending him – but I put his acts far lower in seriousness than science-fraudsters whose actions may lead to the death of patients and misuse of animals is research. This is the great thing about blogs though Chris – we all have different opinions. As for your double standards accusation – I would suggest a person who steals a loaf of bread be punished less than someone who poisons the bread supply. Armstrong only confessed after being utterly exposed, so it’s difficult for me to feel very charitable towards him. As noted above, he repeatedly attacked (verbally and legally) anyone who suggested that he might have doped. Years of cheating followed by years of self-righteous indignation and abuse, all of which made him wealthier than most scientists could ever hope for, and he gets to wipe the slate clean with a few days of groveling? I think if a profuse public apology were all it took to win forgiveness, many of the scientists with (well-deserved) ORI bans would be happy to comply. But most of them don’t have access to Oprah; Science and Nature are the best they’ll be able to do. I don’t really believe that most science fraud leads to the death of patients, either; I certainly wouldn’t compare it to “poisoning the bread supply”, especially since that implies deliberate attempt to do bodily harm. The average paper in Journal of Western Blots is going to have very little direct impact on clinical applications – at best it is a starting point for future, more targeted studies. Patients dying of cancer today will not live to see the benefits of basic research. (Many of these papers don’t take very long to get retracted either, compared to the drug development process.) Science is not a zero-sum game, for that matter; nothing prevents another researcher from correcting the mistakes of the frauds. I did not suggest most science frauds lead to deaths of patients, but some certainly have contributed. “nothing prevents another researcher from correcting the mistakes of the fraud.” accept the frauds themselves, evidenced by the bullies who tried to oust Fraudster, grant bodies and the wish of whistleblowers to remain fruitfully employed. The problem remains – whistleblowing is not taken seriously by Universities. they may say they do….but they are more than likely to come down on whistleblowers like a tonne of bricks, if given the chance. Much of the science-fraud of the sort reported on Retraction Watch doesn’t cause harm (let alone death!) to patients. The vast majority of it (plagiarism, image manipulation, manufacturing data etc.) is done for pretty much the same generic reason that Armstrong cheated – to boost the career of the miscreant over his fellows. Various degrees of dispicableness all round. There is a very worthwhile question about the adverse consequences of scientific fraud. You may have some counter examples but my feeling/experience is that the majority of fraud (outwith the “corporate level” science fraud which is another matter altogether) has rather little consequence beyond the local cohort of other scientists in the field (time wasted pursuing false directions or attempting to reproduce flawed analyses; relative loss of resources/prestige/career opportunity if the miscreant wins grants/fame/jobs as a result of their fraud; adverse effects on whistleblowers etc. ), editors and reviewers (time wasted), and the miscreants and their associates (consequences on careers if found out or associated with fraud – some of this can be serious and horrible). But in the vast majority of cases the wider effects are small since before an analyses impacts the clinic it is normally reproduced, and extended. Putting it bluntly, if a fraudulent paper addresses a sufficiently important subject the work will likely be explored by others and found out; if it isn’t found out it probably wasn’t important anyway. Even an example as serious as the Wakefield MMR-autism link fiasco, which one can justifiably argue did cause considerable suffering and mortality as a result of loss of public confidence in MMR and reduced immunization below the fail-safe level, was only partly a consequence of the original fraud. There was enough evidence (including retractions by 10 of the 12 coauthors of the essential conclusion of a causal link) to reject the Wakefield hypothesis already in 2004 and much of the damage was a result of a misguided (to say the least) reporting/frenzy by some newspapers. You may be right on the last point, but I believe the long term impact of even the most minor fraudulent incident is far greater than you imply. I believe that scientific progress is in many ways akin to compounding interest, where early success has a profound impact on later returns. Given that, what is the long term cost of scientific dead ends started by fraudulent publications? How much good (or at least good science) could have been done with funds stolen at the beginning of the war on cancer? How many patients are still waiting for new treatments that remain undiscovered? In many ways, white lab coat fraud is a deeper form of evil than white collar fraud. Had LA not cheated. Had he not become a hero for cancer survivors. He would have never been able to start the Livestrong organization which has contributed millions to cancer research. Do we think the person that would have taken his place as “the best ever” would have done the same? If not, is cancer research better off because of LA’s lies? Are we closer to cures because of LA’s lies? In the big picture, considering the terrible damage done to others by LA, and considering the good the Livestrong organization has done for society…..
if you could go back in time and could out LA for cheating…would you? I would, but I could understand the reasoning of those that wouldnt. The same question can be asked of somebody like Muchowski, who cheated in a way that “did not harm others” to get a grant. What if his research will lead to some major cures for the diseases he is studying? Perhaps without that grant he would have gotten out of science. Or how about a fabricator who, by accident, fabricates important results that happen t correspond to reality and lead others to do more research on it and result in important discoveries? What matters is the intent (premeditation to commit fraud). The final outcome could be a mitigating factor, but with a small overall weight: the person knew he/she was doing something unethical and chose to do it anyway. What if Livestrong was just a part of the plan to pull off the blood doping scam? Lance seems capable of that. I’d gathered from your comments on previous threads that you had a zero threshold to misbehaviour Stewart (e.g. ”If a science-fraud person makes up a blot, the he should be gone. I dont want to see a scale of 1-100… 1, you can do it again and again, just with more skill and at 100 you get fired. Either its fraud or its not.” ). But on this thread you do think that some misbehaviours are less serious than others, and so there is a scale of misbehaviour after all. Glad to hear it! Your criteria for forgiveness seems to be that the fraud should be carried out a massive scale involving aggressive denial for a decade in which the spoils of victory are falsely appropriated, and when the weight of evidence renders the denial untenable, that one attempts to rescue the situation with a televised bout of something akin to crocodile tears. That level of chicanery is forgivable; however one made-up blot and you’re gone…Does some like a double standard to me, but as you say we all have our views…..
Why would a scientist make up a blot Chris? Sounds like situational ethics to me! – A PhD student is near the absolute deadline for thesis submission and needs a blot to establish as additional evidence that the protein he has pretty much established is expressed in a cell line under particular conditions really is there. He can’t get the thing to work, panics, and makes up a blot. – A postdoc has performed an experiment a number of times with reproducible results but has been a bit sloppy with her labbook and hasn’t kept a decent example of a western…but she knows she can produce one when required since it seems to be a nicely reproducible system. He supervisor tells her that he’s been invited to write a paper for a themed issue of a journal and they need to put together a MS by the end of the month to make the deadline. She gets down to repeating the experiment to get some nice figures for the paper….but….the experiments doesn’t work now for some appalingly undefinable reason, and not wishing to let down her supervisor she fudges a blot…. It is more of a philosophical “back to the future” question. We now know what good came from LA’s lies, and not all of the bad. If you could go back in time and out him, would you? If Muchowski’s cheating eventually led to a cure that saved tens of thousands of lives in the future, and you were living in that future, would you go back in time to now and out him? In the now of now 🙂 the obvious answer is yes. But i think an individual whose life was saved by that cure would probably say NO! im taking things way off topic… sorry. I am planning to rob a bank – but I intend to give half the money to charity – would you stop me? I am planning to assassinate Kennedy, but Kennedy is on the verge of invading Cuba and the Cubans have held back some short range tactical nukes – would you stop me? If I could go back in time I would have some bigger priorities on my list than Lance Armstrong. I think I would invent PCR before that swedish guy did. You may not wish to invent PCR if you knew the ordeals Kary Mullis went through to prove the invention was his. I think he may have spent a third of his life in court. Lance has admitted his guilt, it’s a long road back to normality, but at least he has taken the first steps. If academics did the same, some of us may be more forgiving. AFAIK, you think incorrect. Mullis hardly spent time in court to prove the invention was his, the one case was filed against Cetus and not himself and was over in a few years (and he himself wasn’t there most of the time anyway, not being one of the defendents but just a witness). Unless you mean the court cases where he showed up as expert witness, but those were not to discredit him as an inventor. Well, if I could go back in time, I would want to see dinosaurs. More to the point, though, the issue of good results coming from weak (not fraudulent, but merely poorly supported) data is an interesting one. One of the bigwigs in our field had the nickname (behind his back, and not his real name) Bob “n=1” Smith, because his sample sizes were always very low. On the other hand, his intuition was very good, and led the field into very interesting areas. I wonder if some of his papers would survive the publication process now, or would have been retracted. Nonetheless, the contributions were often remarkable. That kind of science always makes me uncomfortable, and I tend to beat experiments to death before I believe them, but there are indeed grey areas in between. Well, it might be hard to make a decision against evil if you thought that some good might come of an evil action, particularly if the evil action leads to your short-term benefit. That’s how some people think. Especially when the “evil action” is simple inaction–not reporting a fraud of which you have knowledge. The short term benefit is your not being flogged as a whistleblower. Not entirely off topic. Perhaps the later good, say a cancer cure, might come about anyway through some one else’s work even if you stop the fraudulent work. On the other hand: how often does good come through an evil action? I don’t think it happens that often, really, although it’s possible to think of a way it could happen. Can anyone give an example where it really did happen? Help me out here. Oh, wait: what about the HeLa cell line that violated Helen Lane’s privacy rights and cheated her (and her heirs) out of huge amounts of royalty income? Was the good that came of that enough to counterbalance the bad? It wasn’t all good, either: think of the huge amounts of viral contamination in that cell line. Apart from the Coyle paper, there are also papers by Atwood and Bowen (2007) and Bongaerts and Wagener (2007), both in Medical Hypothesis. Atwood CS and Bowen RL (2007). Metabolic clues regarding the enhanced performance of elite endurance athletes from orchiectomy-induced hormonal changes. Medical Hypotheses 68(4): 735-749. Bongaerts GPA and Wagener DJT (2007). Increased hepatic gluconeogenesis: The secret of Lance Armstrong’s success. Medical Hypotheses 68(1): 9-11. Anyone is allowed to air a hypothesis. I am guessing the success rate of these hypotheses are not great, but you don’t want to stamp on people airing ideas. For my sport, I am willing to make any sacrifice…. Re: “He never hurt anyone.Let’s forgive him….” He destroyed the reputations of dozens of other people and made my sport look like it was a cesspool where everyone cheated, and therefore it was ok. Armstrong is despicable. Br J Clin Pharmacol. 2012 Dec 6. doi: 10.1111/bcp.12034. Erythropoietin doping in cycling: Lack of evidence for efficacy and a negative risk-benefit. Interesting Hugo, maybe Lance does indeed have the genetic makeup of a true champion. What if the drugs merely acted as a placebo on him, unleashing all that potential! That would be ironic. Well perhaps the evidence just go a little stronger? Presumably EPO is just a magnified form of altitude training. If you think altitude training can provide benefits, surely EPO would have to also? I have been told by cyclists that since the Biological Passport system was introduced in 2008, times have dropped significantly. 1) anything in Medical Hypothesis (Hypotheses?) should be taken with a grain or two of salt. That journal has shown up several times already in RW blogs. 2) There is an argument that EPO doesn’t actually improve performance, and the new paper in Br J Pharm supports that idea. 3) It just occurred to me: If Lance had a bilateral orchiectomy, wouldn’t he need supplemental testosterone for the rest of his life in order to sustain sexual and muscular function (not critical to life, but certainly to quality of life)? How was this handled? Anyone know? Unilateral…hence his Twitter handle, Juan Pelota. Didn’t know that…unilateral, heheheh. So the remaining testicle would hypertrophy (or become hyperplastic?) to make up the “normal” amt of circulating testosterone. No supplement needed. No room for cheating by taking intramuscular testosterone. So what did he dope with? EPO? Or has that been clarified? What I’m left wondering is why RW is bothering to report on a paper that hasn’t been retracted? Don’t get me wrong, as investigative journalists I’d say that it quite logical for you to ask Coyle whether he planned to retract the paper. Absent any response, however, it doesn’t seem to me that there is anything new to report upon. As for my views on this case, interested readers can also find plenty of commentary from me on the Science of Sport blog (including where I had to correct some of their mistakes). Thanks for the feedback, always appreciated. As you can understand, our journalistic independence requires that we decide when something is worth covering, instead of waiting for someone who probably has an interest in our not covering something to respond. This story was new to our readers, and timely. Would very much like to hear more about your suggestion that retracting this paper could be a face-saving move that isn’t good for science. Do you have a link with those comments, or could you expound here? Armstrong’s confession might be timely, but the controversy re. Coyle’s paper is clearly old news. The reason that I’m not convinced that retracting the paper would really be best for science stems from the fact that, controversial or not, Coyle’s paper stimulated quite a few follow-up studies, such that we now have a much better understanding of the extent to which efficiency is/isn’t trainable than we did before it was published. To retract it at this point could taint this legitimate course of inquiry even more than it already has been. That, along with the fact that none of the drugs Armstrong has admitted to using can convincingly be linked to improvements in efficiency, leads me to believe that things are better just left as they are. Thanks, again, appreciate the feedback. I understand the story may be old news to you, given that you’re in the field and earned your PhD with Coyle, but we’ll just have to disagree on whether something like this is worth covering right now. For us, the conversation the post has sparked here only reinforces that it is. And again, we don’t let people with an interest in keeping things from being discussed decide when something gets covered. Interesting rationale for not retracting the paper; we haven’t seen “could taint [a] legitimate course of inquiry” as a reason not to retract before. As far as we understand it, the criteria should be whether there is an error, regardless of whether it due to misconduct: http://publicationethics.org/files/u661/Retractions_COPE_gline_final_3_Sept_09__2_.pdf What if a paper is completely wrong, but stimulated further inquiry? That paper shouldn’t be retracted either? P.S. The 1st longitudinal study of which I am aware that reported that gross efficiency during cycling increases with training dates from the 1930s. I therefore have no idea where the Australians were coming from when they claimed that gross efficiency is some immutable “holy grail”. The vast majority of the replies above pertain to Armstrong’s doping, not science. The only error to which Coyle has admitted was citing the wrong paper for how he calculated delta efficiency. 1. If editors and publishers really think something should be retracted, they have the ability to do so unilaterally. I therefore think the fact that Coyle’s paper wasn’t retracted says something. 2. I assume that the VP for Research was referring to other “deficiencies”, e.g., lack of adequate record-keeping. In any case, given that almost 8 y have passed since this imbroglio started yet Coyle’s paper (and Coyle himself) remain, I’d say that UT-Austin must have been satisfied with his clarification of the research record (via the previous letters-to-the-editor). 3. Like Dr. Burnley, I’m also on the Editorial Board of JAP, but this is the 1st I’ve heard that any further actions have been contemplated. In any case, given that no one has been able to prove that the data are in error I’m not sure what an erratum would even say, much less accomplish. OTOH, an editorial drawing attention to Armstrong’s use of performance-enhancing drugs and how this now-known unknown makes interpretation of Coyle’s case study even more difficult than is usually the case might make sense. For the record, the reason I stated that the APS publications committee were deciding what to do was because I asked Peter Wagner (EiC, JAP) whether anything was happening. I guess the rest of the EB won’t hear anything until a provisional reponse/decision is written. Since then, I’ve softened my stance a little: Andy Jones (EB member) suggests an erratum might be the fairest response for Coyle, and with hindsight I agree with that because it acknowledges a problem without losing the data. Oh, and the erratum might simply point out that LA is NOT and 5-time Grand Tour champion! I think Andrew Coggan gets it right here. There has to be more than just insinuation orpresumption of wrong-doing for a paper to be retracted. There has to be evidence either of fundamental flaw (resulting from honest error or otherwise) or of misconduct. I’ve briefly read through the published critiques and Coyle’s responses, and clearly some of the elements of the critiques are themselves wrong or unsubstantiated since Coyle was able to address these fairly robustly. One or two things he admitted weren’t quite right but (to my mind) was rather convincing that these didn’t affect the overall conclusions. So the paper should stand. This notion of “correcting the record” can be taken to silly proportions. The fact is that significant conclusions are generally not made about important subjects on the basis of a single paper. Coyle’s original study is interpreted as evidence of time-dependent physiological maturation increasing aerobic efficiency in a cyclist. But it’s only a single paper and itdoesn’t seem like a subject that can be established conclusively in a single study. Our interpretation of whether physiological maturation of the nature suggested by Coyle is a valid phenomenon presumably arises from a larger body of work that would be/was undertaken if the issue was a sufficiently interesting/important one (and wouldn’t be undertaken if it was generally thought uninteresting to pursue). Apparently Coyle’s work did stimulate further study and so the paper was and is a valuable contribution…that’s how science works after all. And there’s no necessary relationship between Coyle’s study and Armstrong’s recent sanctions although one might consider that proof of drug taking tends to support non-physiological-maturation influences on enhanced performance in Armstrong’s case. But it would be unfortunate if the recent publicity of Armstrong was used to engage in a bout of retraction-hunting. What a coincidence to find an article about Lance Armstrong here. I happened to read “Plastic Fantastic” only days after Armstrong’s confession, and couldn’t help but notice the fact that both had been in denial of the facts for many years. Interestingly, Schön has a presumably much lower risk of financial damage from a confession, but still claims that he did not act on purpose, and has seen all the phenomena he wrote about. Maybe the key difference is that there are no eye witnesses in the Schön case, and very little public interestest to pursue his case further (i.e., make him confess). Or is the much higher number of cheaters in cycling compared to science that makes is easier for a cyclist to confess to doping? Any thoughts?